A 10 minute burpee workout you don't need to fear. A 10 minute burpee workout you don't need to be scared of. Some would go so far as to say my love of burpees is borderline unhealthy, but I find it’s best not to listen to those people – #hatersgonnahate and all that. Burpees are an excellent, total-body movement that just happen to be A WHOLE LOT OF FUN (#bonus). And because they recruit such a large number of muscles, you’ll find they’re also a big calorie burner and one hell of a cardio workout. Burpees are not for everyone — you really need to make sure your form is decent, otherwise you’re risking injury. But once you’re over the awkwardness of the movement (and the general hatred of the pain) you’ll come around to my way of thinking. This little workout is simple – five burpee variations, two rounds, ten minutes. But I guarantee you they’ll be some of the harder minutes of your life, in the best possible way. As you start to feel more comfortable, simply adjust the other way. Voila! 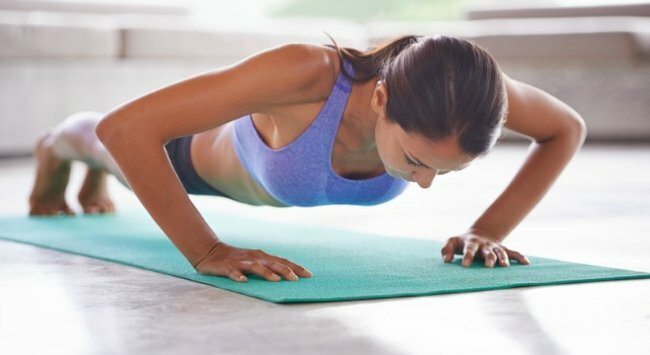 A simple, incredibly effective 10-minute workout you can do in the comfort of your own living room. What&apos;s your favourite quick workout? This post originally appeared on Lazy Girl Fitness and has been republished here with full permission. You can also follow Lazy Girl Fitness on Facebook, Twitter and Instagram.